Designing Schools for the ‘Whole Child’ : Safety, Security and Anti-bullying | Snyder | transformative design. controlled outcome. Safety is a school designer’s first order of business – it makes student well being and success possible. A well designed school can serve as a place of refuge and support amidst the chaos and confusion we know to be adolescence. Project after project, we have seen the correlation between student-centred school design and reduced incidences of bullying, vandalism and security breaches. In our experience, it’s not a simple matter of eliminating dark corners and enabling passive supervision; the built environment must create the conditions for emotional learning and relationship building. A school that fosters a strong sense of student and community connection is inherently safer. Configuring a school for transparency and visual connection throughout. Sight-lines from administrative office for monitoring school traffic and activity. Example – At Our Lady of Grace Catholic School the entry vestibule is designed so interior doors lock forcing visitors to enter the school through the office during the day. Shorter and wider corridors and stair landings (avoid ‘horror-doors’). Openness – nowhere to hide. “Watering holes” or break-out spaces where students can pause, socialize and develop trust and relationships. 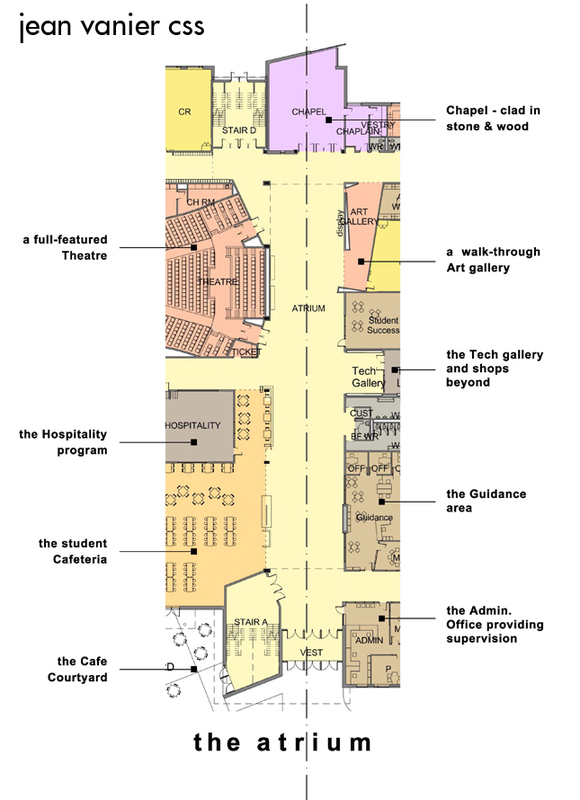 The school layout can contribute to student engagement, connection and trust through strategic adjacency. Learning spaces can send students the message that they are supported and cared for and this has a tremendous impact on school spirit and social relationships. Spaces students can take ownership of such as cafes and lounges. 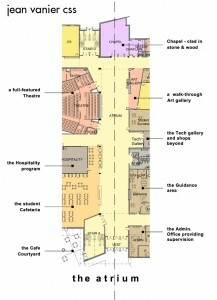 Atria and multi-use spaces that help students connect to each other and to the larger community. Designing for school identity to nurture a positive and inclusive school spirit. Showcasing makes learning spaces safer and more connected through the use of transparency and glazing. Pedestrian and vehicular traffic – safe access to school and play areas. Designing the site for safe parent drop-off, avoiding routes that cross traffic. ‘Zoning’ so students share learning spaces with a common age group. At Alton Village Public School we zoned the school so JK-Grade 1 students were on the first floor; grades 2-5 were on the second floor; and grades 6-8 were on the third floor.